Today we continue the "Wedding Collection" - a series of posts about the handmade details that made my daughter's wedding a very personalised affair. 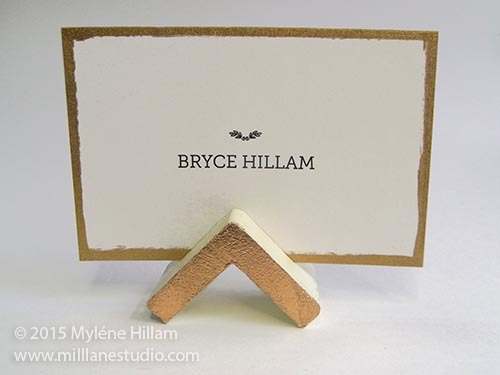 In this post we look at place cards for the reception. 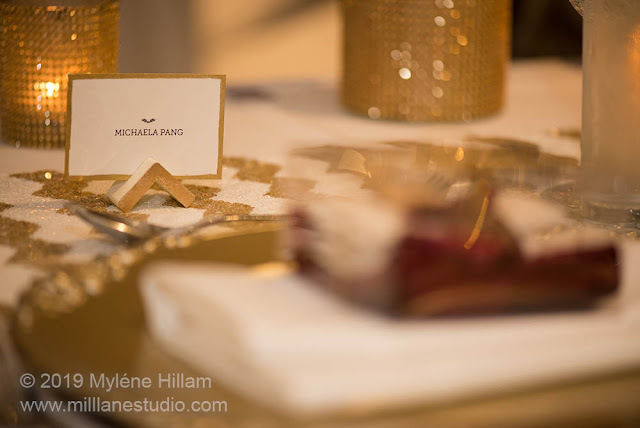 Our creative bride wanted something more than the standard tent-folded place cards being offered by the wedding stylist. 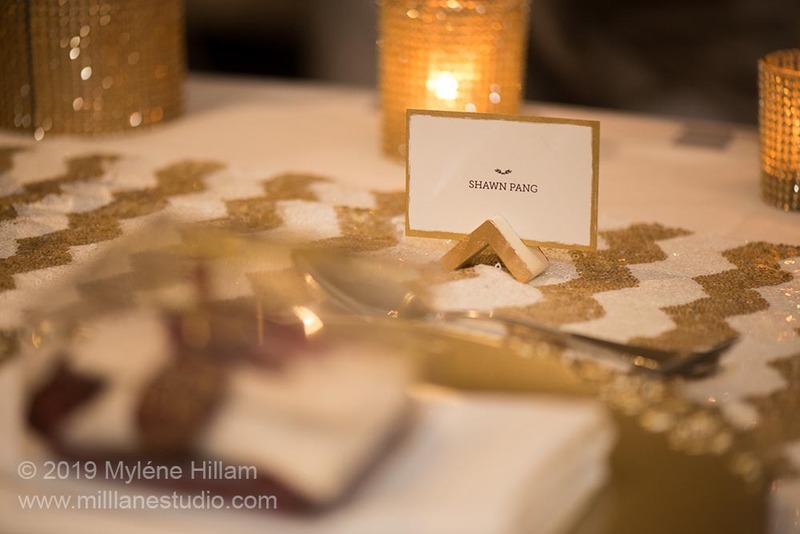 She had a sophisticated, yet simple idea in mind - a triangular piece of wood which would emphasize the geometric chevron pattern on the table runners. 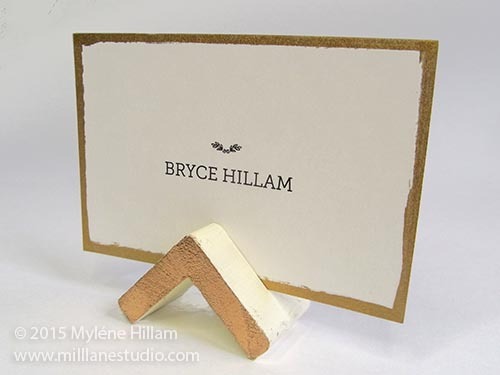 A slit on top will hold the place cards. The project seemed straightforward enough: cut timber into triangles, cut the slit, paint the outside white and the ends with gold paint. I mean, how hard could it be? Well, as it turns out it wasn't hard at all..... but in our haste, we did manage to make hard work of it! It all started out well. 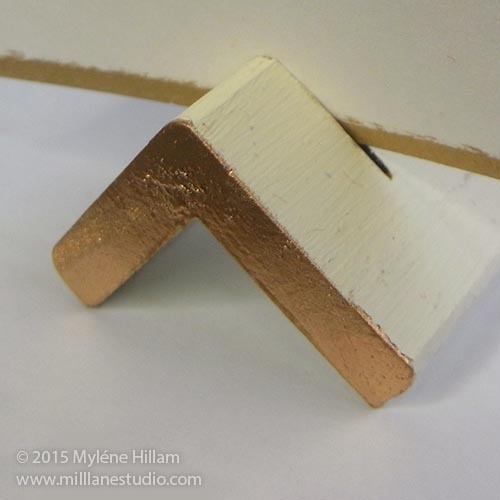 Using this post from the Ruffled blog as a starting point, she found some timber moulding with a triangular profile at the hardware store - perfect! 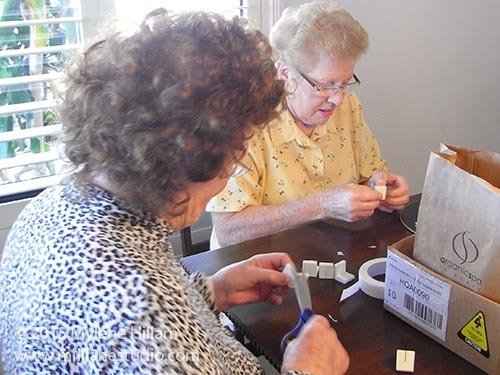 To save time on the fiddly process of painting individual place card holders, the bride gave the whole length of timber a coat of white paint before it was cut into 2.5cm lengths. Her original plan was to do this with a handsaw but luckily, one of the bridesmaid's volunteered her father to cut them with his drop saw - what a legend! Here he is in action. 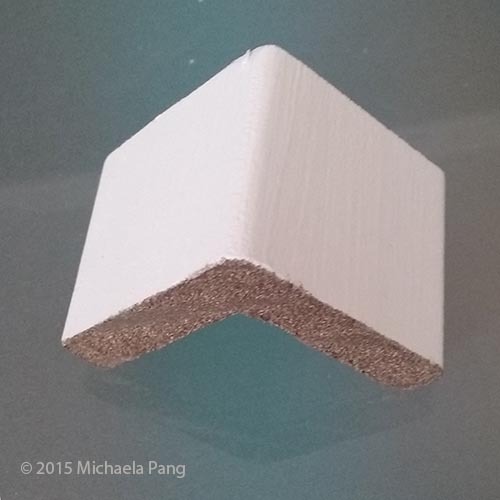 Next, she sanded the cut ends with coarse sandpaper to remove the splinters. At this point we had a decision to make: proceed with painting the ends or spend more time sanding and undercoating them. In the end, our crafty bride decided to push on in order to finish this project as quickly as possible (we still had several other projects to complete). The next step was to mask the white surfaces with tape and then spray paint the cut ends with 24K gold paint. And here's the result - a very textured surface which was rather dull looking, as if it hadn't been painted at all. It was not the bright shiny metallic finish she'd hoped for! There was only one thing for it, we had to go back a step and sand away all the gold paint until the surface was smooth. It took a lot of elbow grease but once again, we had more volunteers who stepped in to help..... thank goodness! My wonderful DH took on the role of being the chief slit-cutter. 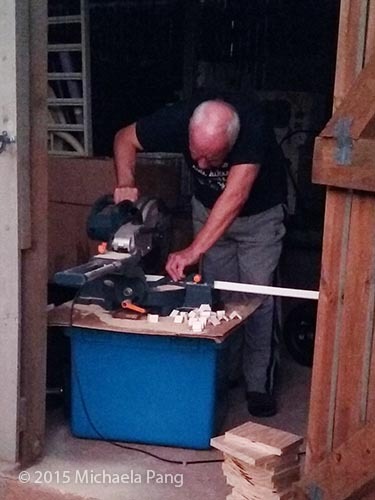 It was a great excuse for him to play with my Dremel whilst trying out his new work bench. Sadly, I didn't take a photo of that step. After the slits were cut, we had to repaint the triangles because the speed of the Dremel blade had caused the paint to singe - it wasn't a good look! But seeing as we had to repaint the outer surface, we decided to undercoat the triangular ends whilst we were at it! Once dried, it was back to taping again. This time we enlisted the help of the relatives who had already begun to arrive for the wedding. Time was getting very short - this was just two days out from the wedding! A cousin stepped in to spray paint the edges. 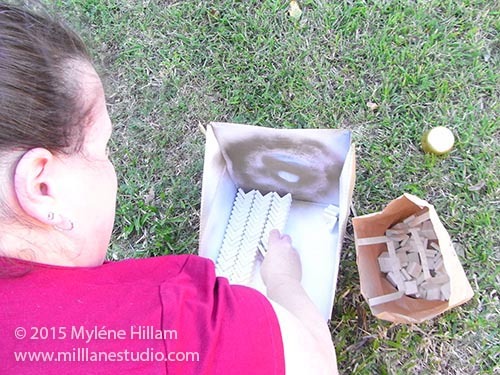 To speed the process up, she laid them out in rows inside a box. 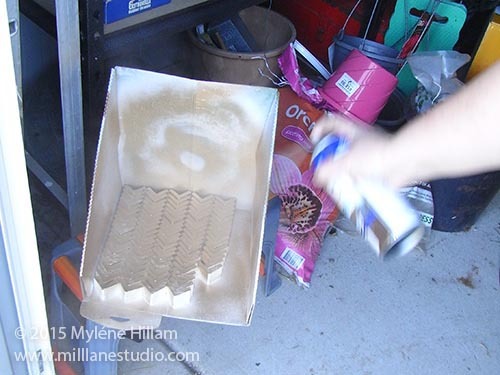 Spray painting was one of the fastest steps and it took just minutes. Once dried, she flipped them over and painted the other end. The last step was to remove the tape and hand them over to the wedding stylist to be set up at the reception. How much better do they look now? It almost looks as though they're foiled in gold. This was definitely the look our crafty bride was after. As with the other projects, there were many helpers who stepped in to lend a hand and we just couldn't have done it without their help. Thank you to you all.